Seems to me that the entree tends to get all the attention in meal presentation. 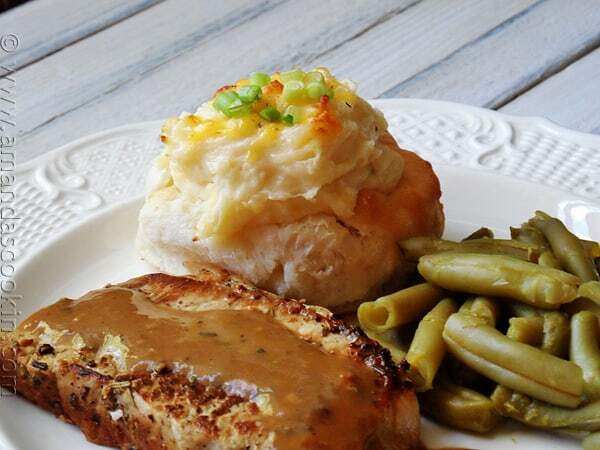 Then there’s the canned vegetable or simple potato dish, but the glory goes to the main dish served up on your plate. I’m all for giving a little spotlight to those sitting on the side, and my love for potatoes drives me to do that, as is this case. 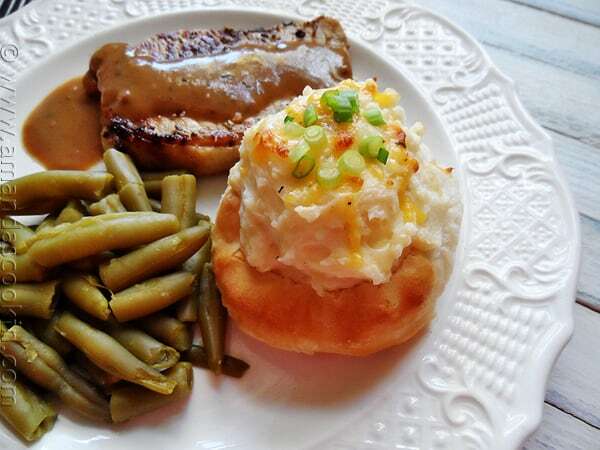 You see, my friends over at General Mills invited me and several other bloggers to tell you why we love Pillsbury’s Grands Frozen Buttermilk Biscuits as that finishing touch to our star entrees. 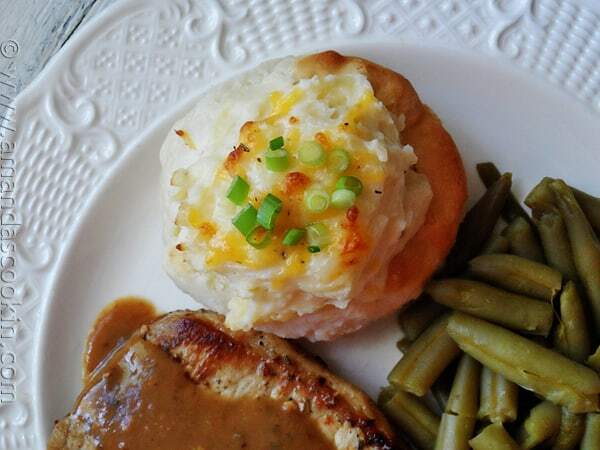 Well I decided to give that biscuit the glory that it deserved by combining them with one of my favorite sides, the twice baked potato. Here’s a really fun tidbit, at least for me! My husband and I were in the car headed for the grocery store and I told him how I wanted to develop a recipe that was different, something that hadn’t been done before. These were delicious, my husband loved them and as far as presentation goes… beautiful! What an ideal side for a dinner party or holiday. The potatoes can be made ahead, just don’t add the cheese. When you’re ready to assemble, reheat the potato mixture in the microwave then add the cheese in. Looking for indulgence? 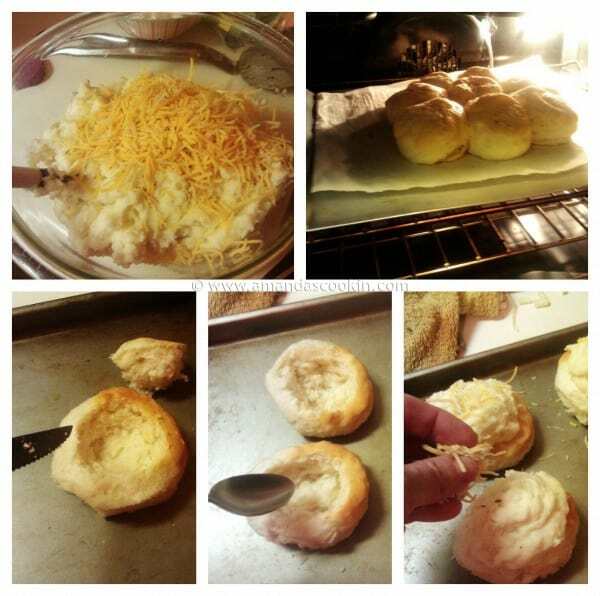 Drizzle a little melted butter over the top of your finished biscuit bowl. Divine! 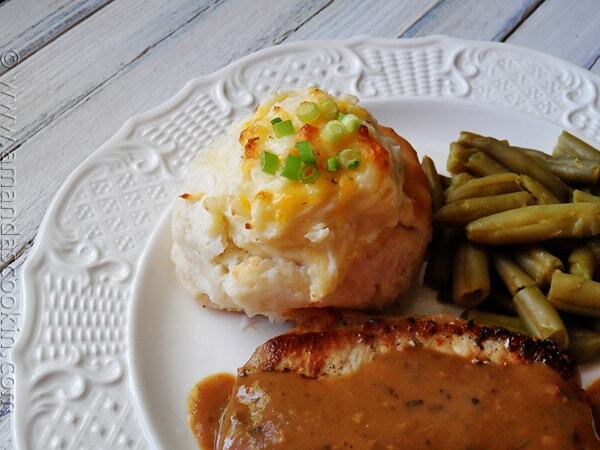 The bowl of the biscuit isn’t huge, but you’d be surprised how high you can pile those potatoes. 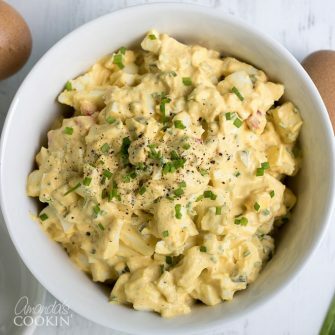 Makes for a wonderful side dish with true wow factor. Bake Pillsbury biscuits according to package directions. Meanwhile, pierce potatoes with a fork 3 or 4 times each and place on a microwave safe plate. Heat on 100% power for 5 minutes. Turn potatoes over and heat for 5 more minutes. Check potatoes by inserting a fork or butter knife. Potatoes should be tender and easily pierced. If necessary, continue heating at 2-minute intervals until done. Remove plate of potatoes and allow them to cool on the counter for 5 minutes. Carefully, potatoes will still be hot, scoop the potato out of the potato skins and place into a bowl. 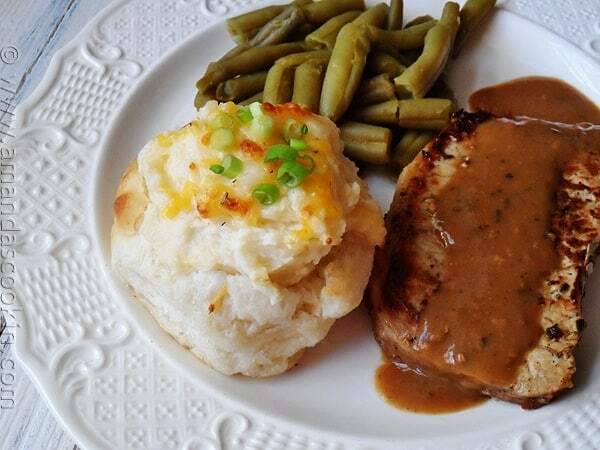 Mash the potato with a fork and add butter, sour cream and salt and pepper. 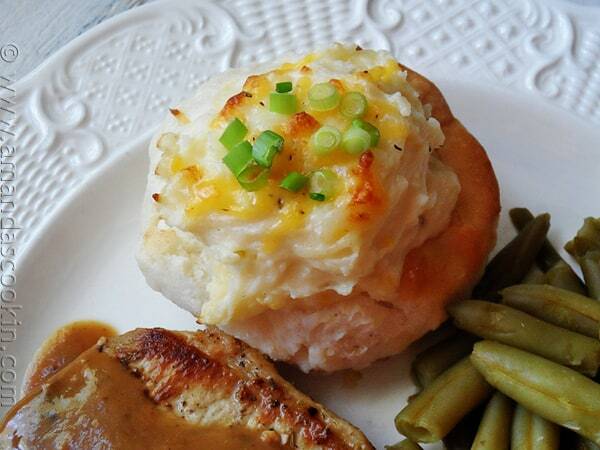 Mix together until creamy, add small amounts of milk as needed to create a creamy mashed potato consistency. Stir in 1/2 cup of the cheese. 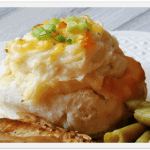 When biscuits are done remove from oven and increase oven temperature to the broiler setting. Use a sharp knife to cut a circle in the top of each biscuit and remove. Gently flatten the inside of the biscuit with the back of a spoon. Fill each biscuit bowl with the potato mixture. Top with remaining 1/4 cup of the cheese and place in the broiler for 2-4 minutes, or until cheese is melted and lightly browned. Remove from oven and garnish with green onions or chives. Calculations based off of full fat sour cream and cheddar cheese, milk is 1%. You can reduce the calorie and fat count by using lower fat or non fat sour cream and cheese. While I was compensated for this post, the opinions expressed herein are 100% honest and my own. Oh yum! I’m diabetic and so normally I don’t make things that are so high in carbs, but I’m making an exception for these! They look so good, I wish I had one now! 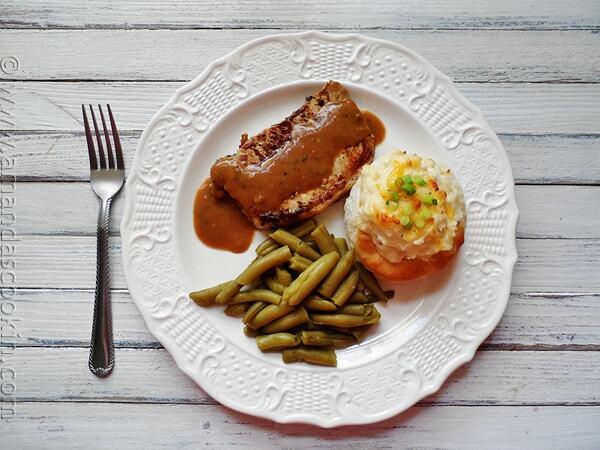 And those pork chops you made look great too, I hope you’ll post the recipe for those! This is am AWESOME idea! 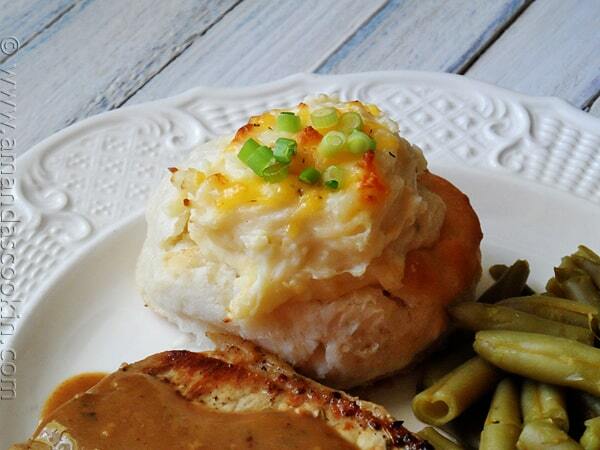 I don`t normally eat biscuits, but I would if these twice baked potatoes were on top of them! Wow. What a perfect idea for Thanksgiving. Love! That is just wonderful!! oh wow. I love the presentation too. So, making these soon!